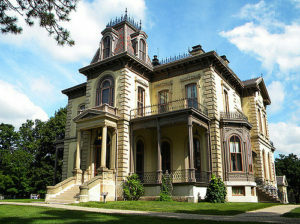 The David Davis Mansion, also known as Clover Lawn, is a Victorian home in Bloomington, Illinois that was the residence of David Davis, Supreme Court justice and Senator from Illinois. The mansion has been a state museum since 1960. The David Davis Mansion Endowment was established by the Board of Directors of the David Davis Mansion Foundation in 2009. Its purpose is to enlighten and entertain visitors with stories of the site, the Davis household, and their special relationships to Abraham Lincoln and others. Distributions from the endowment are used to promote the site and to provide educational programs, particularly for children. Learn more here. If you care about preserving local history in Central Illinois and maintaining this local gem, please consider a gift to the David Davis Mansion Endowment.